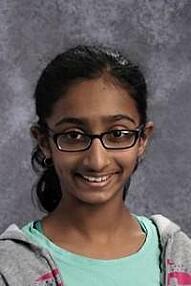 Netra Shetty, grade 8, has attended BASIS Independent Silicon Valley for three years. She has a passion for science and is widely recognized by her teachers as a student who is always willing to help out and is enthusiastic about learning. Outside of school she is an award-winning badminton player, winning 1st place for doubles in the Junior PanAm under 13 division. When Netra first came to BASIS Independent Silicon Valley, she said that it seemed daunting but that perception quickly disappeared. “School is challenging, the courses are complex but fun, and the teachers really take the time to make sure everyone understands,” said Netra. For first period, I have Economics with Mr. Lizardo. I love this class because he helps us understand complex ideas through in-class, fun collaborative activities. We do quite a bit of peer-to-peer collaboration and that helps us prepare for our quizzes and tests. Mr. Lizardo takes the time to help us prepare for our weekly quiz by going over material that we learned that week. By test time, I’m well prepared and so I don’t have much stress at all! Next is Spanish with Mr. Clark. I love Spanish because Mr. Clark really teaches us through fun collaborative activities! He ensures we understand what will be on our tests and I always feel prepared. I also enjoy how he makes the culture come alive through fun activities, like when we made candy skulls for Día de los Muertos. While Chemistry is my favorite, I thoroughly enjoy writing. I have English Literature with Ms. Silva. We learn analysis and the mechanics of writing through fun exercises, journal writing, and lots of in-class activities. Ms. Silva helps us learn how to close-read so that we can understand sub-text and properly analyze a text. I have AP World History with Ms. Abbas next. Ms. Abbas makes history come alive! She uses highly interactive activities to help us remember quiz and test material. What I enjoy about this class is that I get to connect what’s happening in the present to what’s happened in the past. We do quite a bit of critical analysis as it relates to historical context. AP classes are challenging, but I’ve always felt well prepared. Next I have Physics with Dr. Huet. This is a challenging but engaging class for me. I love learning how things work and Dr. Huet’s examples makes Physics tangible. He uses multiple examples when he is explaining complex concepts. He uses visual diagrams, videos, and animations in his lesson plans. He takes the time to make sure every student understands and is prepared. Algebra II and Geometry with Ms. Ganguli. I love math because she allows us to be active collaborators with her and other students. We’re well prepared for all the tests, as we do lots of review packets. We do problems sets on material we learned in class every day. I love Mr. Tucker’s 3D Art Studio class! Our projects are creative and fun. I love that art allows me to relax at the end of the day and express myself. It gives me a break from the rigorous academics and lets me switch gears to access a different part of my brain. Mr. Tucker is fun and he challenges us to look at the world from many different perspectives and get outside our comfort zone.